I’m going to be turning 60 years old in March of 2015. For some people this is one of those mile-stone birthdays, however for myself the only thing I’m looking forward to next year is my much anticipated trip to the Rio Grande Birding Festival. This trip will be my birthday present to myself, and when you reach such an age I think you should be able to splurge a little. However this post isn’t about my upcoming trip to Texas. 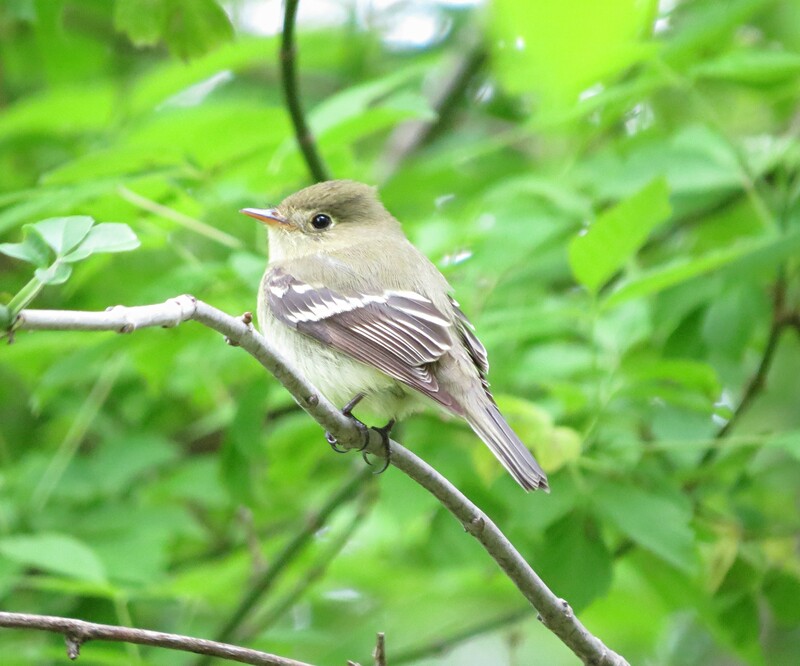 It’s about our abilities as aging birders when those sensory and physical attributes we used to poses in our younger years diminish with age. If you’re a loyal reader of this blog you’ll hear me talk about my friend Jon as we go about birding all over hither and yawn. Jon’s a great birder and a good friend, but the one thing I’ve noticed about Jon, (and rather envious about) is his ability to hear the smallest, high pitched, distant bird call or song in a forest of noise and chatter. At one time in my not so long life I to was able to hear such sounds. However as myself and others get older trying to discern and pick out those smallest of bird calls from all the others can be a challenge. I’ve lost count on how many times Jon will hear a bird call, where I’ve missed it. We stop to listen again, now more intently. You finally hear the call way off in the distance and feel somewhat relieved that you’re not totally deaf. This kind of experience which can be common place with the aging birder, and rather humbling. We as birder rely on our auditory skills to ID, or to locate birds that give us only a “chip” note as you walk by as the only clue to it’s location. How many of you have gone birding with a large group of other people from your local Audubon Society, or your local bird club? Outings like these can be a great way to meet other like minded people, or become involved if your new to bird watching. Exploring a new place with a group is a safe haven for those who would never go there by themselves in the first place. I still go out with groups from time to time. Even the last 2 outing I took to Boone County Cliffs and Adams County were with large groups. But there is a draw back when birding with groups that I’m finding out. Idle talk. If you have a difficult time hearing birds at certain decibel levels, people talking to each other using their normal voices creates this gray noise that’s hard to filter out. And I’m not one to tell others to tone it down either. Whenever a situation like this happens I tend to hang either in the front of the group or the back. Sometimes these older ears need to be away from a crowd to be able to pick up those faint songs. Granted, birding in a large group with experienced leaders can be very rewarding with great birds and maybe a “Lifer” or two. And I can guarantee you I’ll be joining large groups before my birding days are over, but nothing beats birding by yourself or with one or two others. Jon and me know when to shut up and pay attention. We both have good abilities at stalking birds we hear, and so we compliment each other with our natural skills. It’s just he has better hearing than me. We’d all like to go birding in perfect conditions. The solitude of the forest. The windswept prairie, or the desert southwest. However the urban birder who have those elderly ears is faced with other obstacles to deal with. Particularly planes, trains, automobiles, playgrounds, dog parks, and the list goes on and on. A couple of my go to spots for Vesper Sparrows and Rough-legged Hawks are right under the flight paths of local airports. And don’t get me started about trains. Why is it that some of the best birding spots are near railroad tracks? If you don’t have the bird sighted in visually as a train starts to roll by, birding by ear is next to impossible. It’s these background noises, along with the vocal pitch of some birds that constantly remind myself, and I’m sure others, that we’re not as young as we used to be. And if it’s not the fading ears that’s bothering you, how are those joints holding up after a full day of birding? I don’t about you but at times I have to take a therapeutic dose of Advil if I know I’m in for a full day. 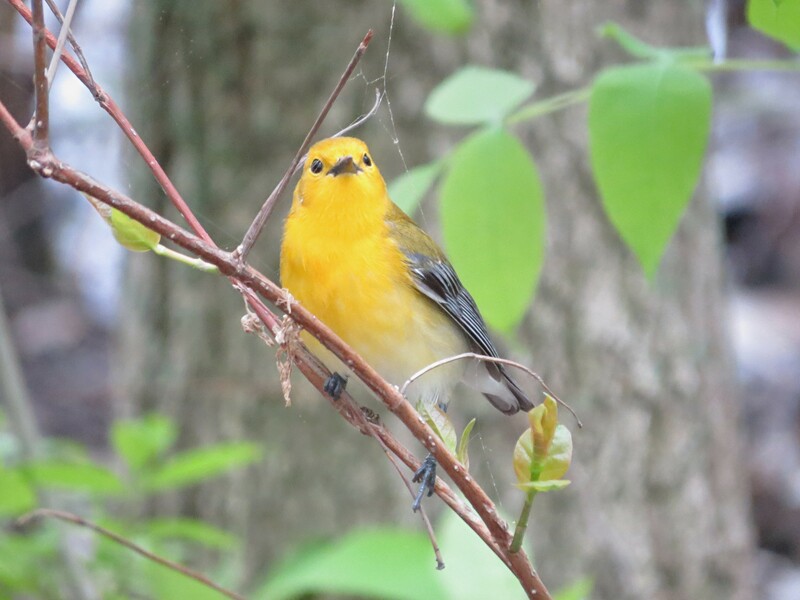 For myself I have to blame it on a Golden-winged Warbler. 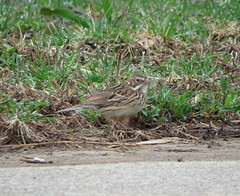 You see while walking rather briskly to catch up to a group who had located this bird at Ottawa N.W.R. I inadvertently stepped into a hole with my right foot. Which in turn almost sent me to the ground with sharp pains in my knee. This was several years ago and one surgery later it still gives me fits when I’m out in the field for a long time. Even if the older birder doesn’t have any preexisting issues, over time the articulating surfaces of our joints begin to wear away, and then the pain sets in. Does this effect where a birder might go on his or her next field trip? Sure it does. My recent trip to Boone County Cliffs involves a strenuous climb in the beginning of the trail. When this field trip was advertised it stated that fact so if you were physically unable for such a climb then you might consider not going. So now the aging birder needs to understand their own abilities when setting off into the field for a day of birding. A great day of birding could lead to joint pain with ice packs in the old Lazy Boy at the end of the day. Even though I work in a hospital I can’t make any kind of recommendation as to what the answer for might be, however to quote Clint Eastwood, “A man should know his limitations” ring true when the older birder ventures out into the field. I do have to hand it to the handicapped bird watcher though, who takes to their scooter and powers their way along. Every year I see several handicapped birders along the boardwalk at Magee Marsh in May. I don’t think I’ve ever seen a ambulatory individual not allow a handicapped birder have access to a particular bird sighting. Granted the scooters do take up a fair amount of room on the boardwalk. And if you’ve ever been there in May you know how crowded it can get. But birders are naturally patient and allow them to move about at the pace they need to. With such conditions hampering our ability to go birding as we age, the last thing we should have to worry about is our eyesight, right? Well next to our ears and extremities, our eyesight ranks right up there in importance. Fortunately for us there are many ways to correct ones vision either with corrective lenses or surgery, which now a days can be done on an out patient basis. Sure there are conditions that the older birder might need to deal with as their vision fades, but with anything medical every person is different, with different challenges we have to face. We then need to adapt to meet these challenges so the aging birder can continue with their passion. For myself I can see at a distance just fine. However I need to take reading glasses with me wherever I go. There’s always going to be a need to reference our field guide while we’re out birding, so if you can’t see the picture well enough, or see that range map, there’s no use in carrying it, right? And if you’re a person who wears glasses, as lots of aging birders do, does your binoculars have adjustable eye cups? If they don’t, then there’s another thing you have to think about. Those bins you’ve owned since your 30’s might not be what is needed now as your eyes age. And since most birders love to upgrade their binoculars, this is one thing you might need to consider when purchasing your new bins. Will these binoculars work for me when I get older? Should I spend a little more to make sure they have adjustable eye cups when I wear my glasses? I don’t know anyone who enjoys getting older, however knowing your own body and it’s limitations, we as aging birders should be able to bird to a ripe old age. 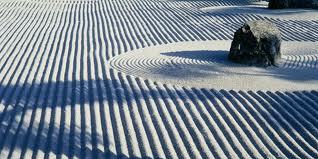 I’m sure the stimulation and hard work we put into this past time also helps with the aging brain. The companionship with others is vital for a healthy mind and body as well. We as birders need bird watching as much as a junkie needs a fix. It’s what makes us tick. And as we age I think we need it more than ever, So be mindful of your body changes and what your plans will be to adjust. Sometimes we can’t do a thing about medical conditions we have, but as a species we’ve been able to adapt to changes for the most part. But if your able to make adjustments as you age, then there isn’t an excuse to not go birding. So once again I’ll be up bright and early one day this weekend, pop a few Advil with mu morning cup of Joe, and head out into the field while I’m still able. I hope to see you as well. 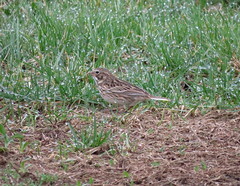 And the 2nd reason is my attempt to tick off the last warbler species east of the Mississippi that has still eluded me. 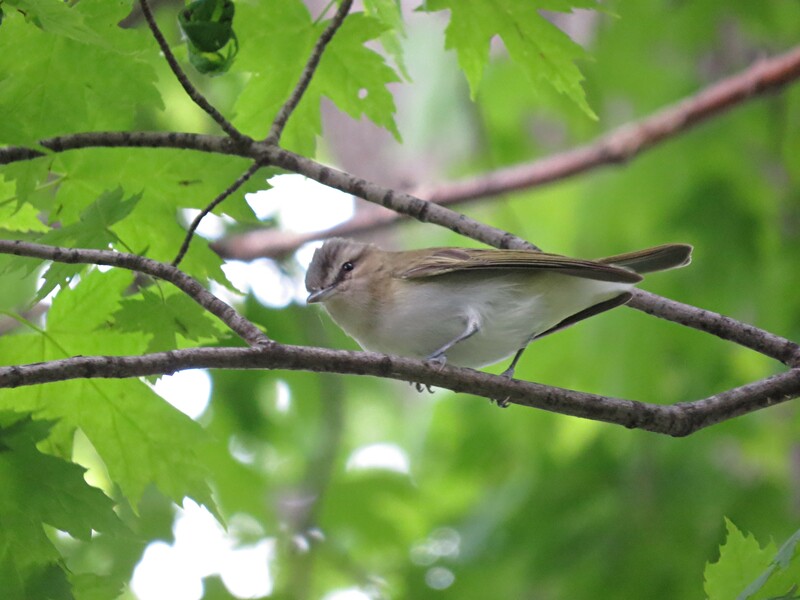 The Swainson’s Warbler. My son has told me he feels confident that this will be no problem. You see he has a friend who also works at Tremont who is studying and banding Louisiana Waterthrush in the area, and she seems to know a thing or two about the bird and where to find them. So with all the help I can muster I’ll have 3 solid mornings trying to pick this life bird. However if I fail at locating this bird, I’ll still have a great time in the mountains as my youngest son will be joining me in the long drive that weekend. So stay tuned, a full report is forth coming. Even though I’ve not written anything for a while, doesn’t mean that I’ve been idle. 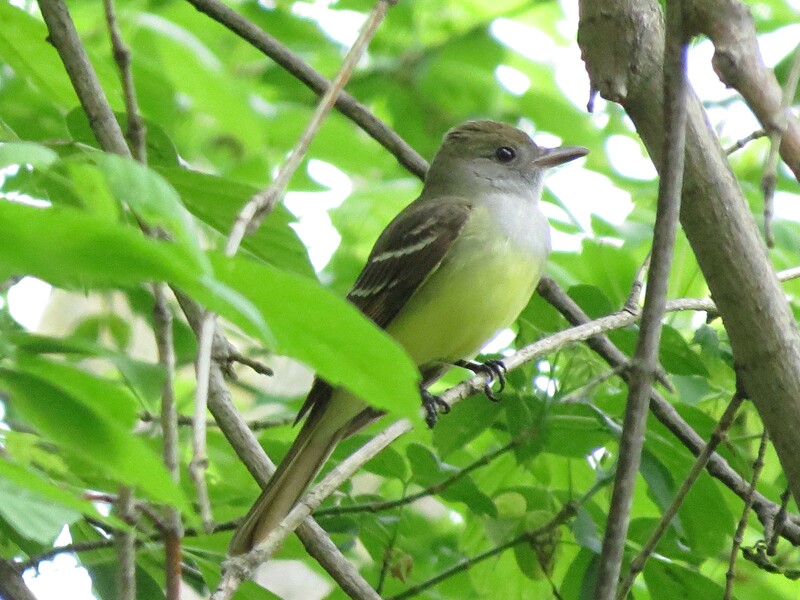 On the Saturday a week ago, and this last Sunday I went out birding with the local chapter of the Audubon Society, and the Ohio Ornithological Society respectively. This is a little out of the norm for me, as I’ll usually go birding either by myself or with one or two others. But as I came back to birding as my full time passion, I would go out with groups quite often. At the time it exposed me to better birders,which always helps, and I was able to become friends with some really nice people in the local birding community. However groups do have there drawbacks which I’ll talk about in a upcoming post. But the first group from the Audubon Society was going to my favorite place, and that’s Boone County Cliffs. It was an absolutely picture perfect day was 15 intrepid birders started our hike. 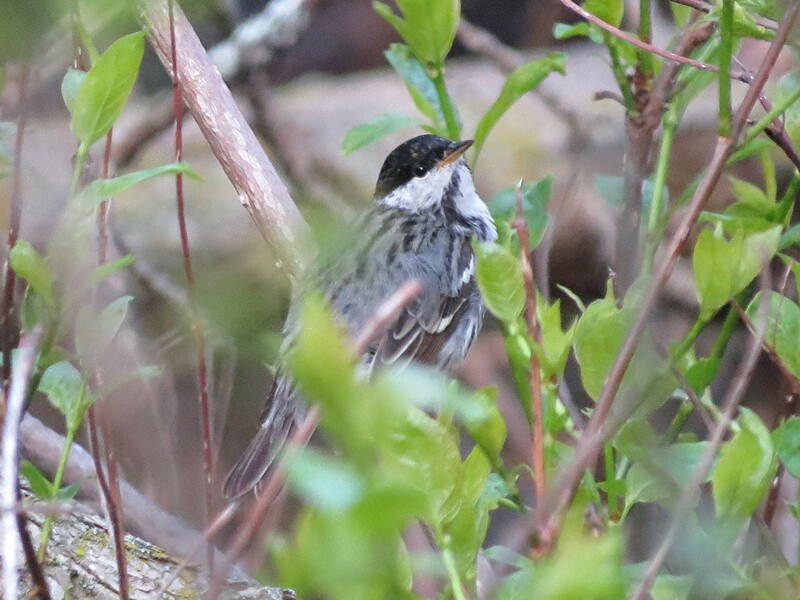 The air was cool and filled with countless Wood Thrushes as their flute-like songs ran up and down the cliff faces. As is the case whenever you go here is that you better be up on your bird calls because birding by ear is where 90% of your day list is coming from. Louisiana Waterthrush sang along the creek bed as we started our assent. Even the sound of the water cascading over the rocks was loud enough drown out their loud song. In the distance Worm-eating Warblers send out that distinctive “Trill”. As the hike wore on I began to separate myself from the main group of people. Trying to pick up faint calls can be a problem sometimes as groups can get noisy from idle talking. As the hike continued we added more birds to the day list. For myself I never took one picture. Some of the only photo opportunities came when we birded along the road as we drove to the parking lot. They were fleeting and frustrating., especially me and my new camera. As the day ended we were pretty happy. Granted it’s a strenuous hike, and no one got hurt, I did have a few issues with some of the talking amongst several people. The volume needed to be turned down when you’re having a conversation with someone else as others try to bird. Now the trip with the OOS was made up almost entirely of different people except for this one couple I remembered from the week before. This large group of 20 people was lead by 4 very experienced birds who really know their stuff, and to top it off Jon was able to come this time, and a excellent birder in his own right. Even though there was plenty of talking going on there was a focus amongst this group that was different. There was a lot of open ears and plenty of eyes as we drove from one hot spot to the next as we tracked down some favorites. We drove and hiked in parts of Adams county I’ve never seen or believe existed before Sunday. From the open valley of Ohio Brush Creek, to forested areas vast and quiet as your own foot falls upon damp leaf covered trails. Ovenbirds singing that typical 2 note song. A Hooded Warbler calls close, then keeps ahead of us as we try to locate it. Once again it’s birding by ear again. However there are times when We do get to see some birds. At this one stop where the Ohio Brush Creek flows under this bridge we all pull over to check out the Cliff Swallows that nest here every year. 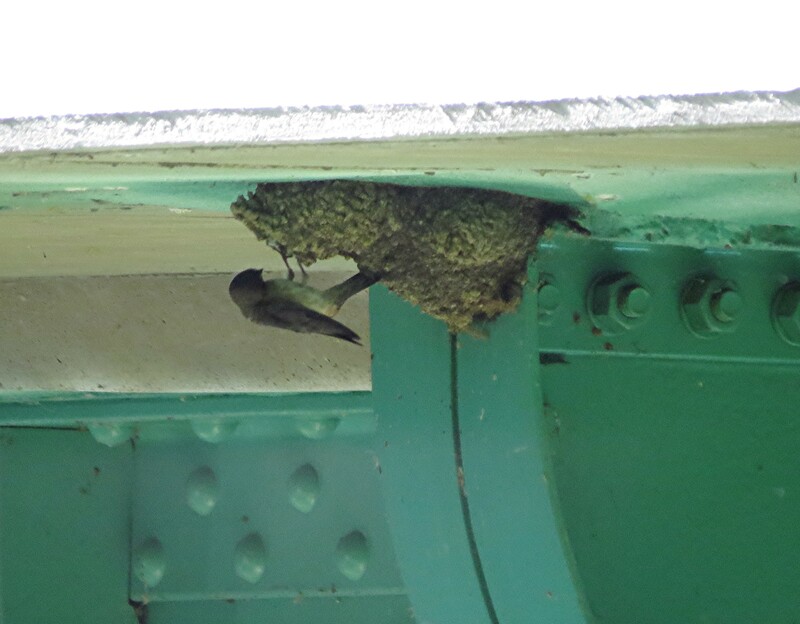 Not wanting to get too close to the nesting Swallows, I opted to stay back a little and shoot this picture of a Cliff Swallow hanging onto it’s nest on the underside of the bridge. Taking a picture while standing in the sunlight into a dark area can always pose a problem. It was while I was taking several shots of the Swallows, Jon calls out that he has a Red-headed Woodpecker. As I quickly turn around I see it on a telephone pole. For several minutes it leaves to telephone pole and flies into the trees that line the Brush Creek, only to return to the same telephone pole. This gave me time to set up a better pictures as the sun just wasn’t right. 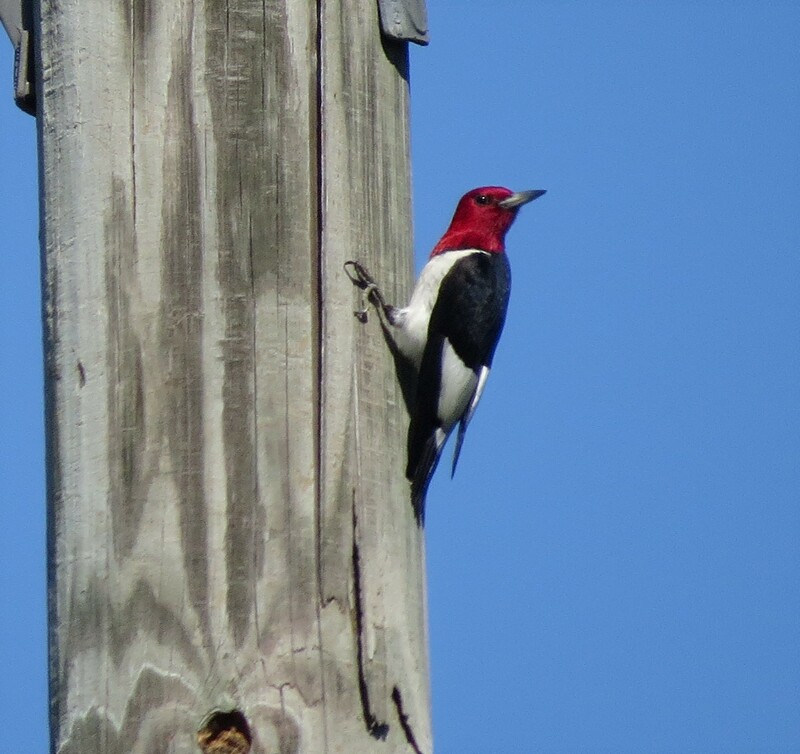 This is the best picture I’ve ever taken of a Red-headed Woodpecker. First they’re not the most common of Woodpeckers, and second they are habitat specific. So you need to know where to find them in the first place to even get a photograph . The day wore on and lunch was approaching fast. Another drive and short hike took us to a secluded shelter house with picnic tables. A much needed rest from all the driving and dust from the gravel roads. It was here that Prairie Warblers entertained and taunted us as they flew about singing. 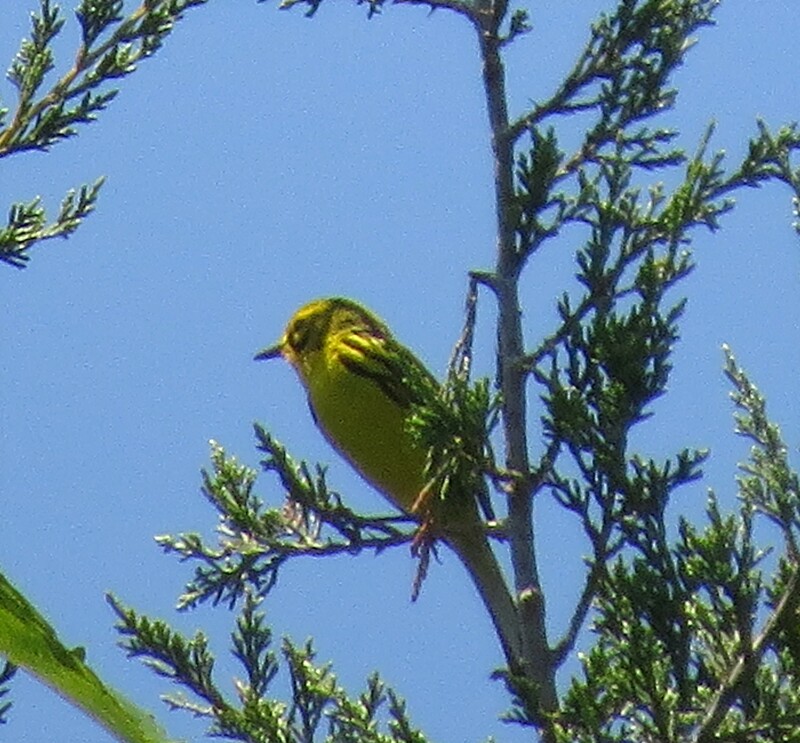 One fellow in the group brought along his digiscoping rig and was trying to photograph one particular Prairie Warbler who enjoyed it’s perch at the top of a Cedar Tree. 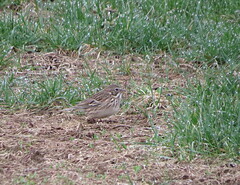 It was a hell of a far shot, but I was able to squeeze off this one terrible photo, but you’re able to ID the bird. As the day ended and while on the 90 minute drive home I couldn’t help but comment to Jon on how different the 2 groups were in the way they interacted during the day. I still enjoy birding in groups, and plans to continue this kind of birding will always be an option. However the quiet, and solitude of birding all by yourself can also be very gratifying. So after tallying up all the Warbler species seen so far this year I now stand at 32. Not too bad. 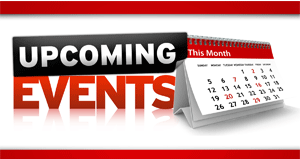 And what’s in store next for me? A trip to the Smoky Mountains to visit with my oldest son who’s working at a environmental camp, and to try for a life bird. Swainson’s Warbler. This trip will be happening during the 4th of July weekend, and i know it’s probably too late to hear them, but I have a ace up my sleeve. Someone who works at the camp is studying Louisiana Waterthrush and has set up mist nets to band them. My son tells me she knows where they are. 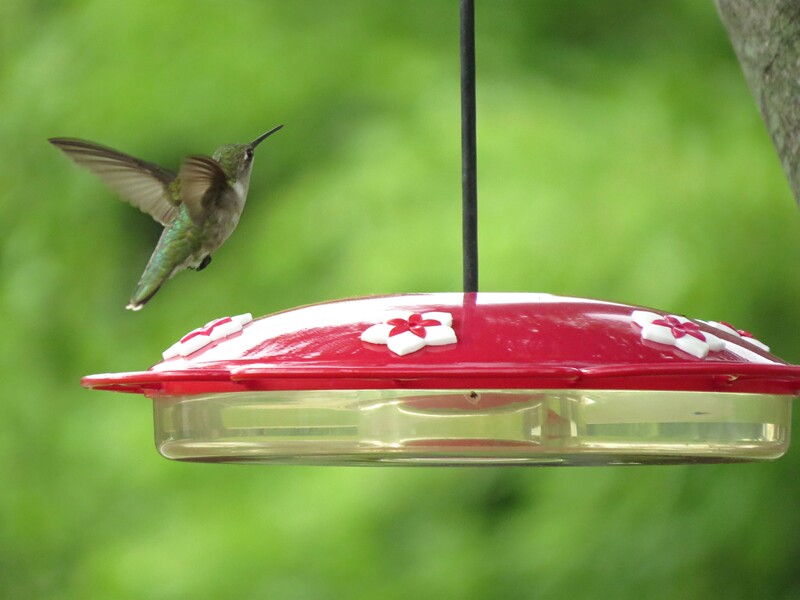 Hummingbirds are a great distraction after a hard day at work. After they get used to you being near they can become pretty fearless and on occasion get within feet of me. I have 2 feeders hanging. One from the tree in my front yard and the other near a hanging basket of flowers on my front porch. Lately I’ve taken my camera and waited. It’s not just Hummingbirds that seem to enjoy my food. 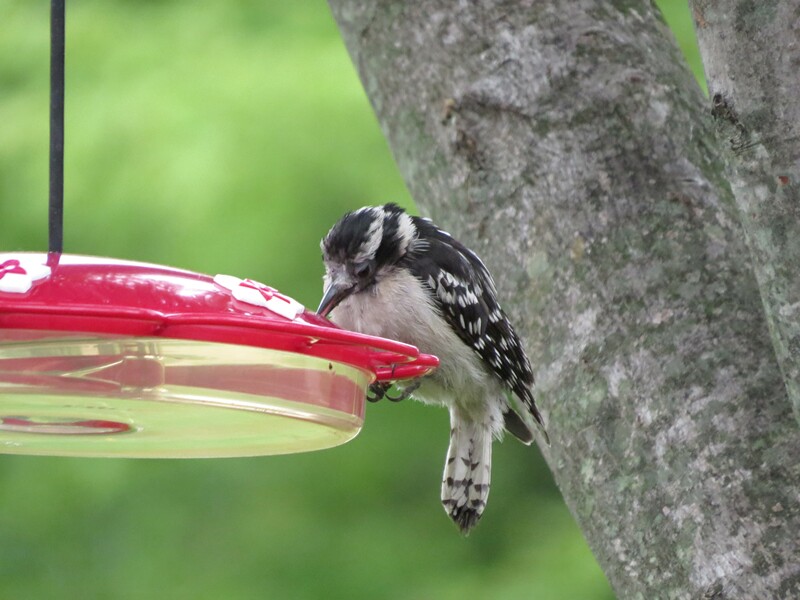 This Downy Woodpecker has been visiting for the past few days. Now I’ve been feeding birds for a very long time, and never have i seen this kind of behavior. 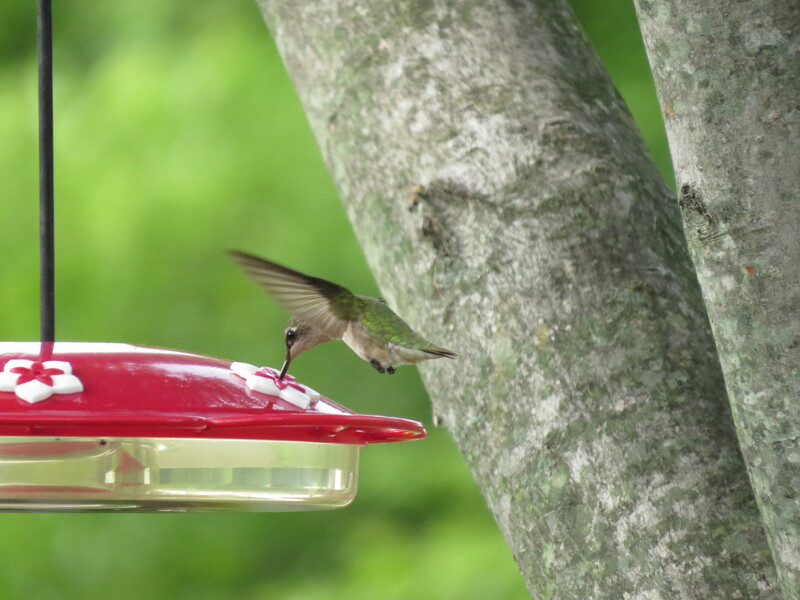 Now I’m sure this has happened to others who feed the Hummingbirds, but it’s a first for me. 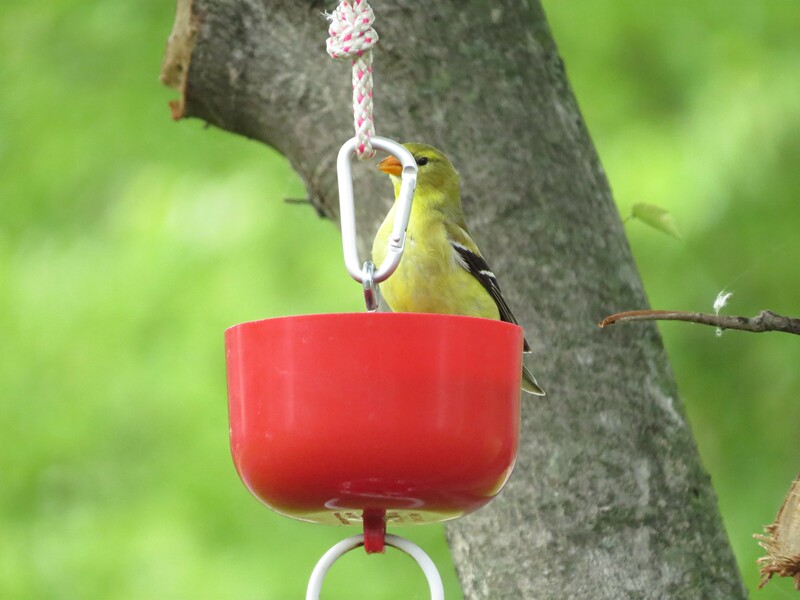 Then there’s this Goldfinch who is either drinking the water in the ant trap that hangs above the Hummingbird feeder, or it’s eating the ants that are trapped in it. It will shinny down the cord and do whatever it does. I think it’s getting a drink. Finally, after going through all of the pictures while on vacation, it seems that I’ve only come away with just a few really good photos. I’m certainly not disappointed in the performance of the camera, it worked great. It’s getting just the right picture, with a bird that cooperates, and the lighting just so, and the auto focus catching up with the action. However when nature wants to do it’s own thing, we as rank amateur photographers have to try our best and hope that we get some salvageable shots. I’m sorry for taking so long in getting all the pictures processes, this wasn’t my intention. It’s been a little busy with other things going on other than bird watching. And as the Summer heats up I tend to do less birding, but there are some plans in the works with some awesome field trips and maybe a trip to visit my oldest son who’s working in the Smoky Mountains for the Summer. So more to come, and I hope you enjoy the few remaining pictures from my visit to the Lake Erie region. 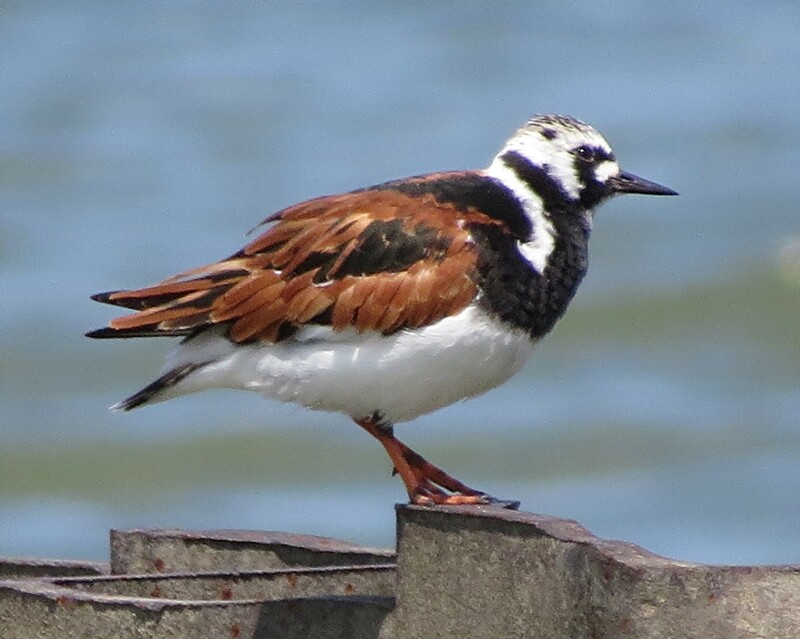 Ruddy Turnstones. 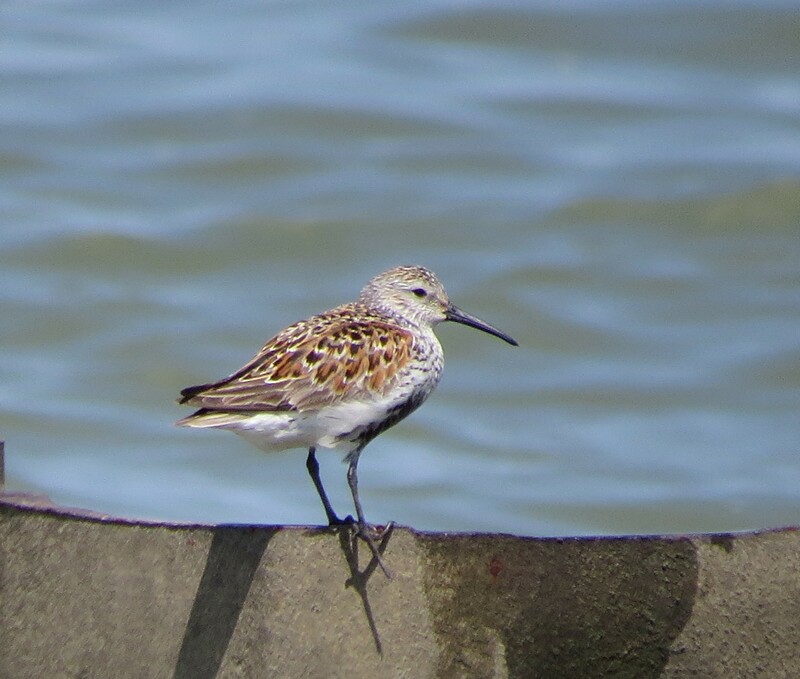 At one time there were over 80 Dunlin and !0 Turnstones all on this one break-water. 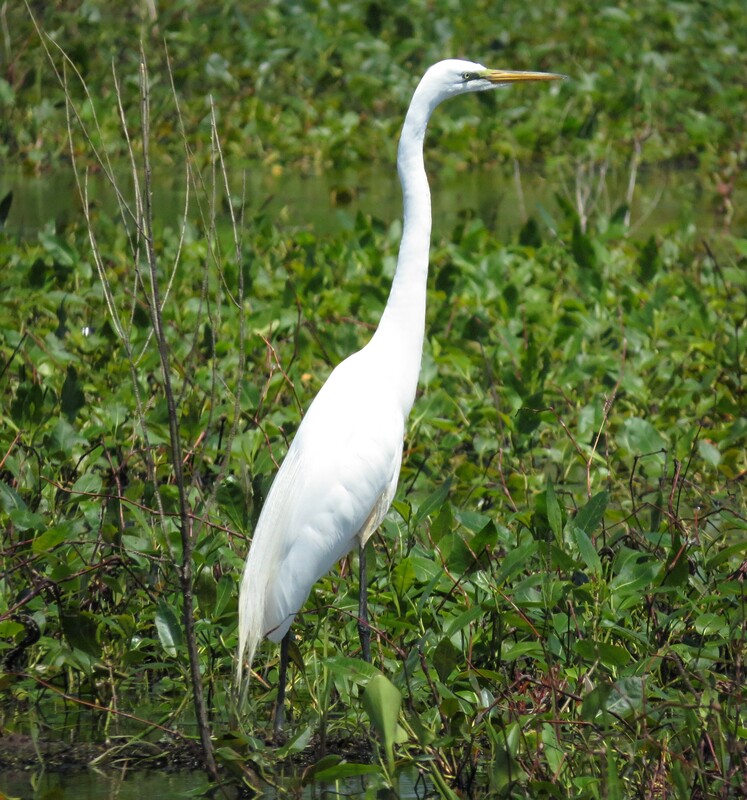 One thing you can always count on are lots of Great Egrets. There one of the few birds that rank amateur photographers love, only because they like to hold real still as they hunt for food. 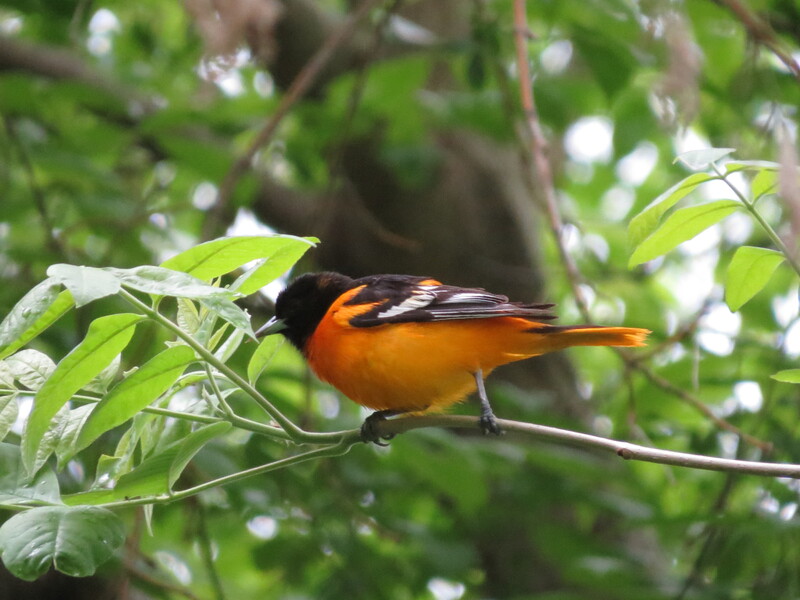 One of the few clean shots I had at a Baltimore Oriole. 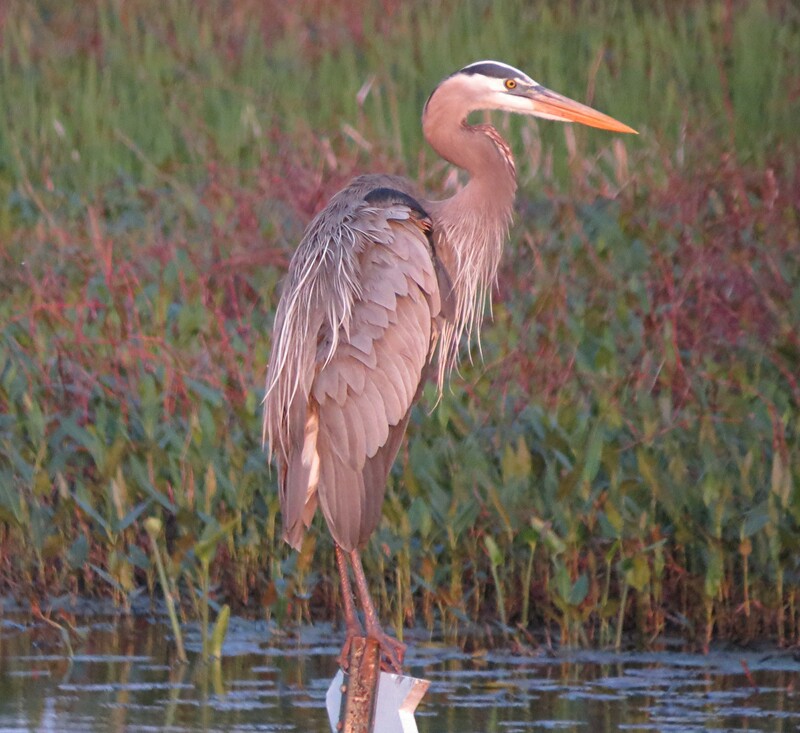 And as we were leaving on our last day, the sun was setting over the marsh casting this great color on this Great Blue Heron that was perched on this sign.